The present work describes the extension of an existing aeroelastic coupling environment to free-flying aircraft with rigid-body degrees of freedom. Aeroelasticity affects an aircraft in terms of performance, economics and operational safety. Therefore, fluid-structure interaction has to be taken into account early on in the design process. In the transonic regime non-linear effects preclude the application of linearised methods for the description of the flow field. Instead, Computational Fluid Dynamics (CFD) have to be included into the aeroelastic analysis framework. To do so, the partitioned approach with a dedicated solver for each solution field has proven most flexible, and has been adopted at RWTH Aachen University with the development of the Aeroelastic Coupling Module (ACM). The ACM has been successfully applied in a number of projects, albeit so far only to restrained configurations like wind tunnel models. 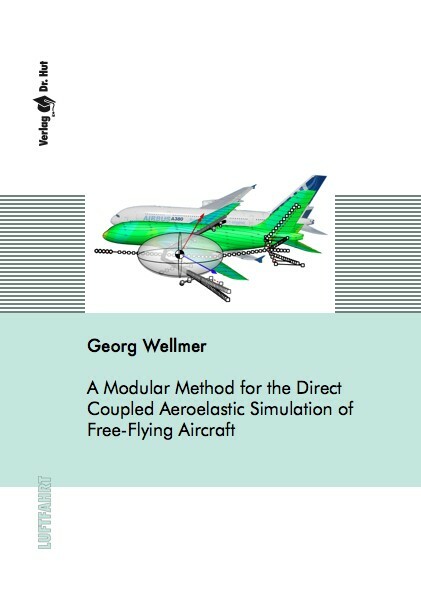 For the simulation of real aircraft the presence of an artificial restraint presents a major limitation during the investigation of such design cases as the calculation of gust and manoeuvre loads or the prediction of trim drag. The extension presented in this work concerns the steady and unsteady simulation of configurations with rigid-body degrees of freedom. As the partitioned approach is employed, the rigid-body motion is realised by means of additional solvers. For steady flight, controls have to be actuated by a trim algorithm in order to achieve an equilibrium flight state. The trim algorithm works without prior knowledge of the control derivatives, which are determined during the simulation run. During unsteady simulations, the rigid-body motion is integrated in time. To prevent that loads are accounted for twice, once in the rigid-body motion and then again in the structural deformation, a mean axes system according to Milne is introduced. Moreover, the distributed structural loads have to be so modified by inertia loads that their total sum vanishes in this moving reference frame. The algorithm is put to test with a generic Ultra High Capacity Aircraft. Departing from a steady trim state, it is excited with gusts of different lengths. With the mass and stiffness distributions defined for the model, unstable coupling occurs between the short-period mode and the symmetric wing main bending mode. A tentative instability mechanism is identified, which is somewhat similar to body freedom flutter.